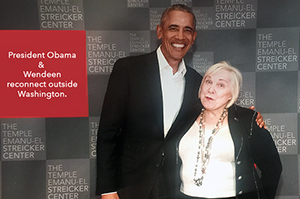 Last week, Wendeen reconnected with President Barack Obama, outside Washington (where they first met in 2008), at a stirring event held at the Streiker Center/Temple Emanu-el. After sampling chef Daniel Boulud’s famous short ribs, the President took pictures at a VIP reception before the Event. He would soon settle in for a “conversation” with Rabbi Joshua Davidson in the main sanctuary of the temple. In earshot of Wendeen’s friends, nearby, as she approached to greet the President, he called out to her , “Hi Wendy.” She joined him–responding with this smile, caught by the camera! The only people who call her “Wendy” are family (Wendy was her nickname until she turned 6! ), singer Wayne Newton, a client and longtime friend who resides in a world of his own, and the good president. Wendeen couldn’t bring herself to correct the president! There was good reason that President Obama resonated deeply with his audience. He offered simple and sage advice to attendees on how to thrive in our complicated world. He said, “I tell my girls, “Be kind and be useful.” Wendeen is grateul for his perspective.